What was it like to travel in the 1930s for Frank and others? Though the early years of the thirties saw horrible unemployment, sometimes as high as 25%, according to US government documents of the 1930s, train travel was not too expensive for many families. From the 1890s, traveling by train was fairly expensive, but in the 20s prices were becoming lower. In 1933, there was a sudden drop in fare prices. Carriers were allowed to compete for business and many fares dropped to between one and two cents per mile. All costs considered, this was still thought to be more expensive than traveling by car, but only if there were four or more passengers in the automobile. The convenience of sleeping while someone else does the driving was not mentioned. As the prices dropped, the hobos arrived. Frank grew up with the train tracks in his back yard. He always remembers, NO ONE would take a handout. They offered work first. Oh, Frank didn’t mind Mama and Aunt LaLa feeding the weary travelers. He did mind the job they offered-chopping wood. Frank thought that made him a man. He wanted them to offer making the Lie Soap or cleaning the chicken house. Oh well. Frank always admired the pride they showed. No taking without working! 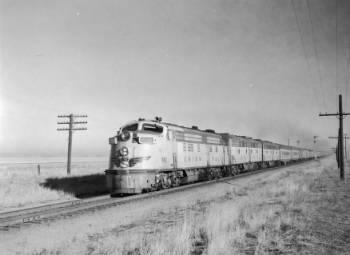 PHOTO CREDIT: Denver Public Library, this train is similar to the ones passing through Frank’s neighborhood in the 1930s.